Bang in the centre of the country, Umbria is often referred to as the ‘green heart’ of Italy. A fertile, forested region, it is known for its truffles and wines - and is where several of the best Italian knitwear factories are located. Umbria Verde, which has been there since 1959, is named to reflect this tradition. And it does its best to reflect the name in its practice too - electricity from solar panels, reused water and so on. This is not a glamorous atelier, however. Unlike the slightly unreal-feeling factories of Cucinelli, or even Zegna and Santoni, it is an obviously industrial space. Noisy looms run the length of the hangar-like structure, with offices in the floor above. Although the countryside is lovely (and they produce their own olive oil - as many in the area do), inside is all busy practicality. Simone Mattioli runs Umbria Verde today, having taken over from his father, the founder (below). 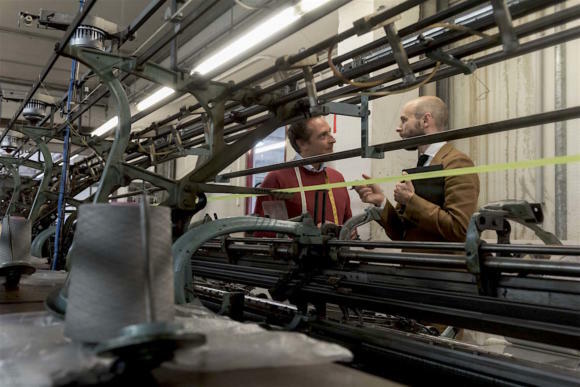 Mattioli senior was the first in Italy to import an English cotton loom in the 1950s. As with much between the industrial revolution and then, England dominated the production of such machinery - though no more. That loom became the foundation of the business, and he gradually added more over the years, importing and (importantly) often modifying them. 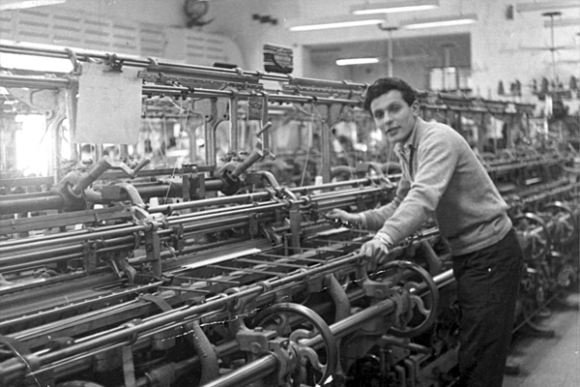 In the factory today, the oldest loom dates to 1964, and the youngest to 1974. A particularly unusual one is from Protti (now closed), with a long 2.5-metre bed. The team found it in Bulgaria. Needles and some other parts are replaced every four years - with the last such manufacturer in England, based in Leicester, under contract to carry on supplying them for the next 20 years. As with other factories we have covered, it is easy to assume that a factory has access to any technique it wants, and merely has to decide which is the most efficient. But actually there is great inertia at a manufacturer - as investing in new machinery is hugely expensive. Often hand techniques (eg hand linking for socks) are kept only because the process of transitioning away from them takes hundreds of thousands in investment, and therefore many years. And the best machinery might even be the older stuff, not the new (eg. with benchmade shoes). There, you can’t even buy the best, but have to wait until it becomes available. 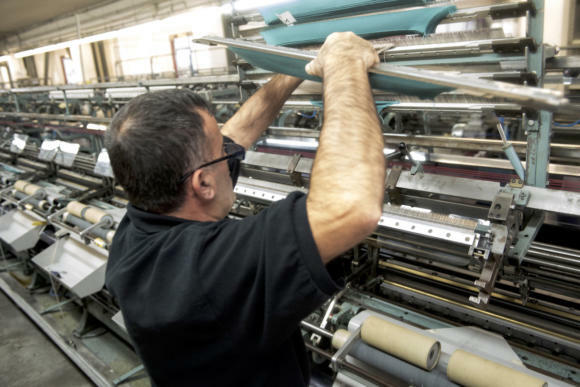 Umbria Verde’s modification of its machinery is important both because it has led to its trademark production - 37-gauge knitting - and because it reflects the general attitude of innovation. Examples are the production points on our Finest Knitwear: flattening of knots, hand-sewn points, widened fashioning seams. You can read more details on our original post on the knitwear here. 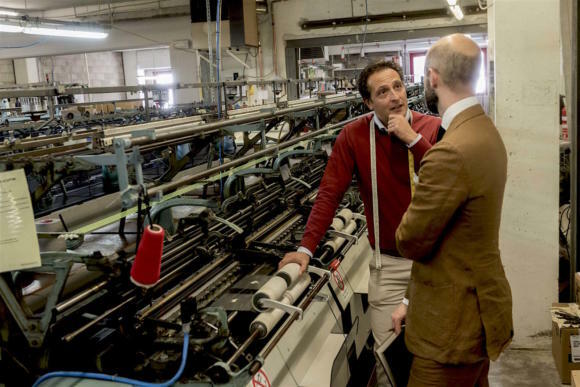 In another comparison to factories we have visited, it is interesting that as with mills such as Pennine in Huddersfield, Begg in Ayr or Vitale Barberis in Biella, the finest craft at Umbria Verde is the repairs. At a mill, which is weaving rather than knitting, any imperfections in the cloth have to be repaired by knotting in a new piece of yarn and weaving it through the cloth. 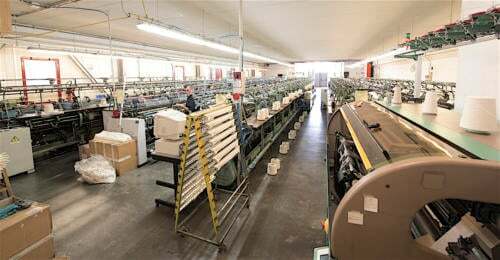 It is done under a microscope, and in stark contrast to the fast, noisy, large-scale production of cloth in the next room. 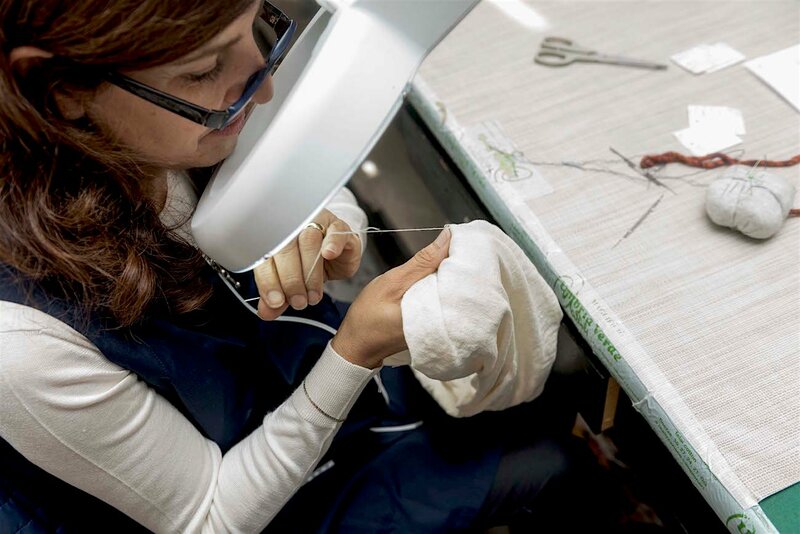 Although the contrast is not as great at Umbria Verde, the process of repairs is similarly precise. For knitwear it involves darning as well - so fine that it is invisible on the finished piece. Simone is both passionate about his work and a real professional. Over the past couple of years we have built up a good working relationship, and the Finest Knitwear is something we are both very proud of. Of course, he also works for many of the big fashion labels (we can’t say who, but it hardly matters). Here, his innovation and Umbria Verde’s relatively small production help a lot with the labels’ new designs and ideas. “It’s great to be able to work with everyone and anyone,” he says. The Finest Knitwear was released in its second batch last week, with a green colour added to the navy from the first iteration. Around two-thirds have sold so far, but only one combination is sold out (green medium crewneck). In the pictures I am wearing my tobacco-linen suit from Langa in Madrid, with a white shirt and navy grenadine tie. You can follow the discussion on Umbria Verde knitwear: Factory visit by entering your email address in the box below. You will then receive an email every time a new comment is added. These will also contain a link to a page where you can stop the alerts, and remove all of your related data from the site. Hello Simon and thank you for another very interesting article. On your suit is this the one where you were unhappy with the sleeve or shoulder? It is a lovely colour but in the last photo of you walking up the steps, it does seem that the shoulders are not quite right – though of course that could be a trick of the light. It also seems a little shorter than your usual style but could that be the material rather than the cut? When I had a linen suit made I was told to add 1/2 inch to the jacket length to take account of the material rumpling in the way linen does; I thought that was excessive but over the years I think my tailor was correct. Yes, exactly. It was that the shoulders weren’t quite the same in line and construction – not really reflected in the image at the end. You’re right, this weight of linen did wrinkle a lot, and it could have done with being a cm longer probably. Hello Simon, do they have a factory outlet at their factory in Perugia do they only selling via other brands? Just via other brands. They don’t sell their own brand at all. Long time lurker here. Simon, have you ever done a deep-dive on Morning Dress? I plan to be pretty trad but would love to have some insights on cuts, styles, traditions and who to use! Hey. No, not really I’m afraid. I guess it’s something I’ve never worn myself, and have no occasion to, so it’s only ever been of limited interest. Understood. Do you know of any resources on it, or any tailors who specialise or are known to be strong at it? The Row tailors all have strong experience – and in general the older, more experienced tailors are more likely to have made it before. But no personal experience to relate I’m afraid. OK. Would be very welcome if you hear anything, if any other readers have some insight! Russell at GB will do a nice job. Is there anyway of finding out who Umbria Verde manufacture for? That way I know I am buying quality rather than just a label. I think that’s a slightly wrong approach Joel, to be honest. 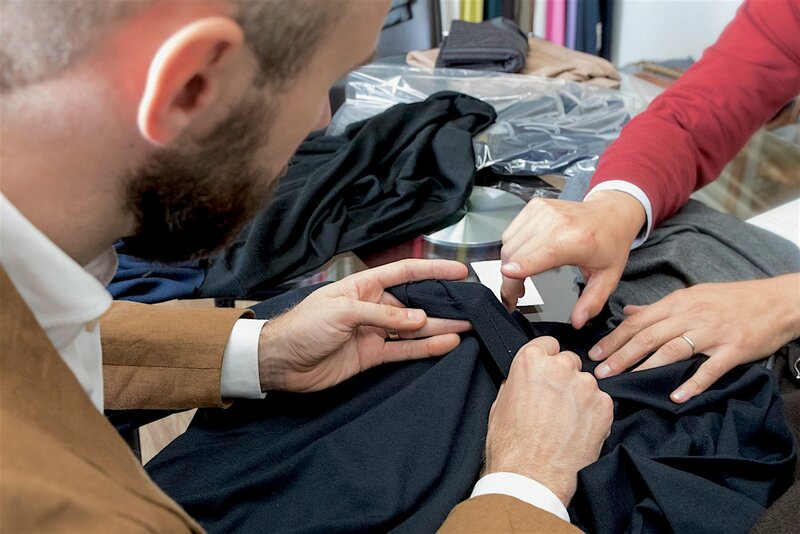 The vast majority of designer brands product quality – particularly classic-menswear designer brands, such as Brioni, Zegna, Purple Label, Tom Ford etc. The issue is usually price, given the marketing and other things that those brands pay for. But quality is pretty much always very high. As I’ve commented elsewhere, it’s also misleading to focus on a factory as a guarantee of quality, as they offer various different levels of manufacture. I could have opted not to have the extra fine-finishing points on my knitwear if I had wanted. I can recommend G D Goldings in St Albans – they do a lot of military and Livery stuff but produce wonderful morning suits (and proper evening tails too). Not cheap for a provincial tailor (if St Albans is provincial) but certainly less than the Row and slightly cheaper than GB. However don’t go for the price but the traditional quality. Looking at the factory pictures I am astonished that you rate Lanificio Zegna less industrial than Umbria Verde. Thank you for the info and Explanation. Sounds a place worth to visit! Hi Simon, for health and safety reasons you should not wear a tie in the shopfloor around machinery (as it appears to be the case in one or two of the pictures). The tie could get stuck into moving machinery and strangle yourself. 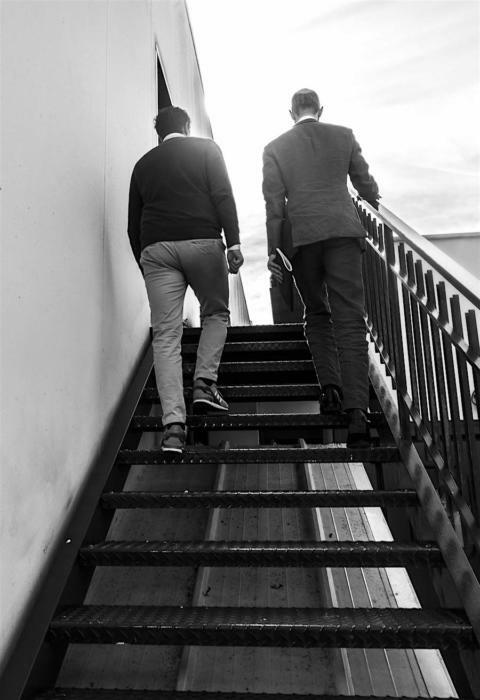 We want you to come back to your family safe when you visit industrial environments. And keep showing the beauty of industry! Love this post. I’m sure it’s very hard but could you do a post on some of the other knitwear manufacturers around the world, especially China. It really bothers me when I see some designer-wear clothes that are really expensive yet are made in China. It just feels like the designer has chosen the cheapest way to make the clothes using China. I shouldn’t, but I always like to see “Made In Italy or Made In England” on the label even though I know China is probably excellent at what they do and probably in some ways have more technology than than their Italian and English counterparts. I know what you mean Joel, and it’s not a bad start in looking at quality, but there are so many exceptions. Particularly on technical clothing. So you’re saying you’d like to know what ‘good’ Chinese manufacturers are, or find a way to know what a quality China product was? Regarding your second paragraph, both please.